There’s much more to this city than Central Park and a pastrami sandwich at Katz’s. (Though both of those things are wonderful.) If you’ve visited a number of times and have exhausted the travel guides, or if you live here but haven’t yet had the chance to really explore, then read on. I’ve been here 12 years, and I still come across surprises. These are some of my favorites. Walk the length of Broadway: Sure, you’ve seen a show on Broadway, but have you walked the entire length of the thoroughfare, starting at 220th street and ending at the Battery? It’s a 13.2 mile walk, so make sure to schedule food and drink stops along the way. 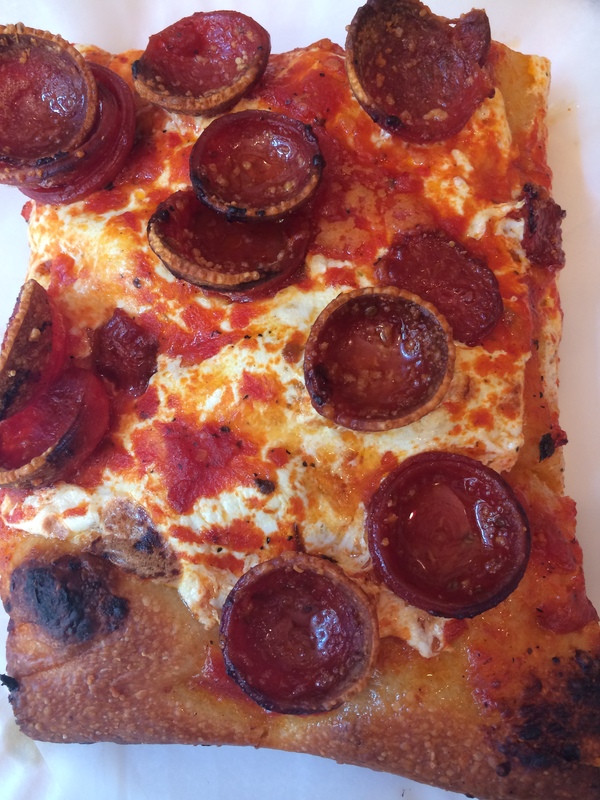 Celebrate the finish line with trays of square pepperoni pies at Adrienne’s on Stone Street. Franklin D. Roosevelt Four Freedoms Park: Some of the best views of Manhattan are found off the island. Take the tram to Roosevelt Island (view from the tram pictured above), and walk to the southern tip. You’ll pass the former smallpox hospital, one of the most haunting buildings in the city. The park itself is pristine and sprawling. The trees are saplings and don’t provide much shade, so wait for a not-scorching day. City Island: Eat your way through piles of fried seafood on City Island, a picturesque New England-like village off the coast of the Bronx mainland. In addition to being home to a handful of destination restaurants, the main street, City Island Avenue, is lined with familiar small-town spots, like ice cream and candy shops, art galleries and antique stores. Incredibly, it’s all within city limits. The Morgan Library: Recently named one of the 50 Most Beautiful Places in America by Condé Nast Traveler magazine, the Morgan is something out of a fairytale. (I’m reminded of Beast’s castle library in Disney’s Beauty & the Beast). This once-personal library of 19th century financier Pierpont Morgan features a trove of rare materials like early children’s books and music manuscripts. Unisphere and Queens Museum: Visiting the Unisphere in Queens’s Flushing Meadows-Corona Park, one gets a taste of what it must have felt like to see the structure for the first time at the 1964 World’s Fair. There is a futurist’s optimism to the design; it looks like something from a sci-fi film, one in which all nations work together to conquer challenges. Next door, the Queens Museum is home to the Panorama of the City of New York, a to-scale 9,335 square foot model of the city. Morbid Anatomy Museum: Was Wednesday Addams always your go-to Halloween costume growing up? Do you obsessively look up strange and obscure medical ailments? Are you still not over that whole 90s witch trend? Have I got the museum for you! The Morbid Anatomy Museum in Gowanus features a fascinating collection of obscura in its gift shop, rotating exhibits upstairs and an intriguing lecture series. Oh, and taxidermy classes, if that’s your thing. Wave Hill: This former estate on the banks of the Hudson River is a schlep to get to if you live south of Midtown, but the pristine gardens and the Jersey-cliff views make up for the out-of-the-way location. I’d venture to say this Bronx park is one of the most beautiful spots in the five boroughs. Nargis Cafe: This Uzbek restaurant in Sheepshead Bay has quickly become one of my favorite spots in South Brooklyn. Everything here is delicious, but I especially recommend the plov (rice pilaf with lamb), fried manti (Uzbek dumplings), Tashkent salad (lamb and radish salad), lagman soup (spicy noodle soup), and ALL OF THE KEBABS. It’s BYO whatever, but there’s a $5 corkage fee per bottle, so spring for the larger size and bring a crowd. It’s always lively, especially on weekends. Villabate Alba: Cannoli, made with ricotta imported from Sicily, is what to get at this Sicilian bakery in prime Bensonhurst. I’m also partial to the lobster tails and to gawking at the brightly colored cakes, cookies, and pastries lining the sprawling display shelves. Taqueria El Mezcal: The tacos at this tiny Sunset Park shop are flavorful and authentic, but what really won me over was their cemita. Made on a traditional, fluffy, sesame seed-covered sandwich bun with avocado, shredded queso, black beans, and, in my case, moist al pastor pork, it might just be the perfect sandwich. Coppelia: There’s something very old-school New York about this 24-hour Cuban diner (pictured above) on 14th Street. Past midnight it services a cross-section of nighttime revelers, from those out clubbing in the nearby Meatpacking District to local residents out for a late dinner. 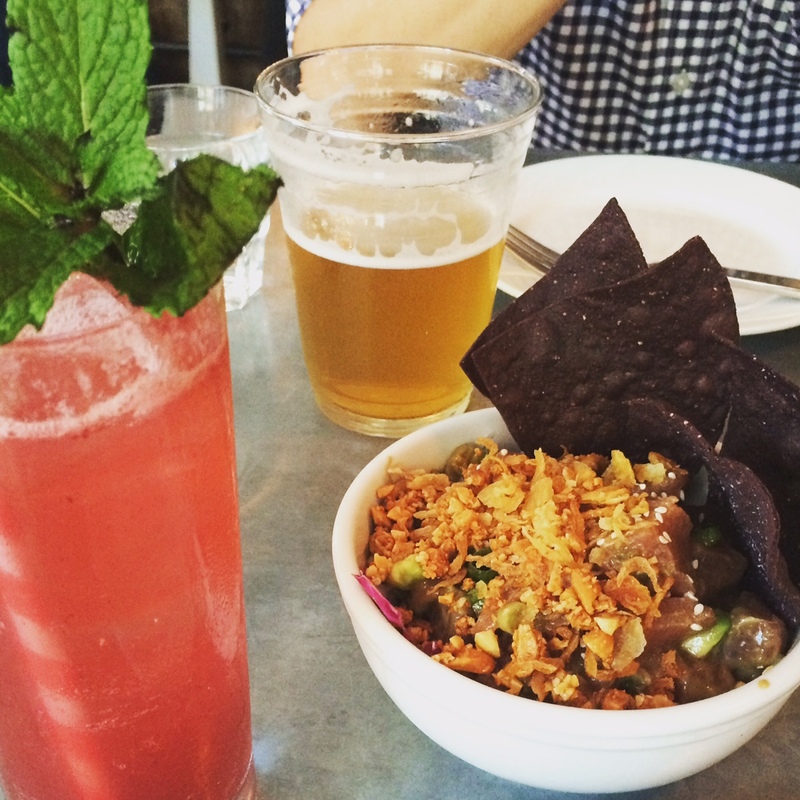 Dishes and drinks are inventive and way better than they need to be for a 24-hour joint. 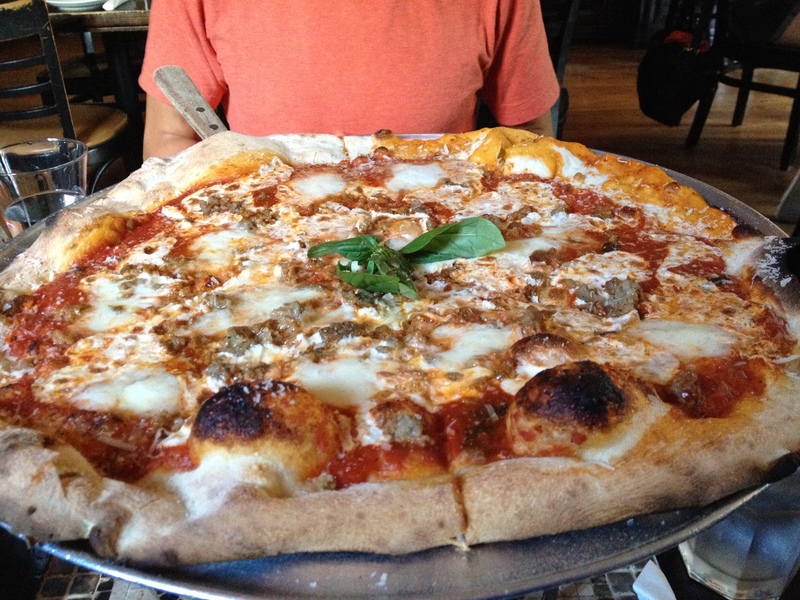 San Matteo Pizza and Espresso Bar: This small, authentic Italian restaurant and sandwich shop is located in an unlikely spot on the Upper East Side. The Neapolitan pies are pretty good, but it’s the panouzzi, sandwich-calzone hybrids made from pizza dough, that are the real standouts. East Harbor Seafood Palace: Come hungry and with not much money in your pocket to this Bensonhurst dim sum hall with a seafood-inflected menu. It’s the size of a small shopping mall, so while the weekends are busy, the waits are bearable. The shrimp dishes–fried shrimp wrapped in bacon, shrimp dumplings, rice noodle rolls stuffed with shrimp–are winners. Goa Taco: The pork belly taco as this fusion-y spot on the Lower East Side (with weekend showings at Smorgasburg) was one of my most memorable recent meals. It was perfectly constructed: tender, crispy-skinned pork belly, buttery paratha (an Indian flatbread), red slaw. The entire dish is a master course in how to make fusion cuisine that elevates instead of dilutes. Wangs: I’m still confused about why this Park Slope takeout spot isn’t a bigger deal. My husband and I have to restrain ourselves every time we walk by, and we’re usually passing by after a filling dinner. Their specialty Korean jumbo fried chicken wings are sticky, crispy, spicy, heavenly. Get them, and the cornbread with salted scallion butter and Thai chili pepper jam, and prepare to fall in love. Luckydog: This low-key bar on Williamsburg’s Bedford Avenue is a dog- and beer-lovers’ dream. It’s an specially good spot for gawkers who don’t actually have a pet of their own. The adorable back yard is like those dog runs you’re only allowed to observe through a chainlink fence, except here, you’re face-to-face with an array of fluffy puppy butts. On a recent weekend night, the place was filled with as many as a half-dozen pooches, from terriers to Pomeranians to labs. Oh, and the beer list is pretty good, too. The Double Windsor: I’m a huge fan of this comfortable, airy Windsor Terrace bar, and not just because it’s less than a 20-minute walk from my apartment. It’s the rare spot where one can get an expertly made cocktail, a sought-after beer, and a stellar burger. Blueprint: “Laid back” and “craft cocktail” aren’t words usually used to describe the same spot. The cocktails at this Park Slope bar are as good if not better than those at more sceney lounges. 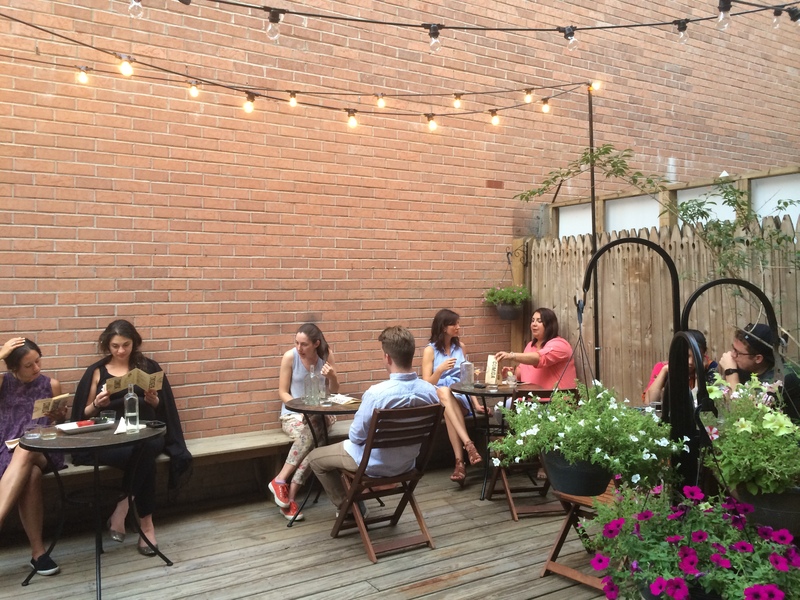 There’s also a lovely little backyard and a very generous happy hour until 7 p.m.
Covenhoven: There’s absolutely no pretension at this beer nerd’s haven in Prospect Heights. Pick a bottle from their expansive fridge (price vary depending on whether you’re taking out or drinking in) or try something on tap. 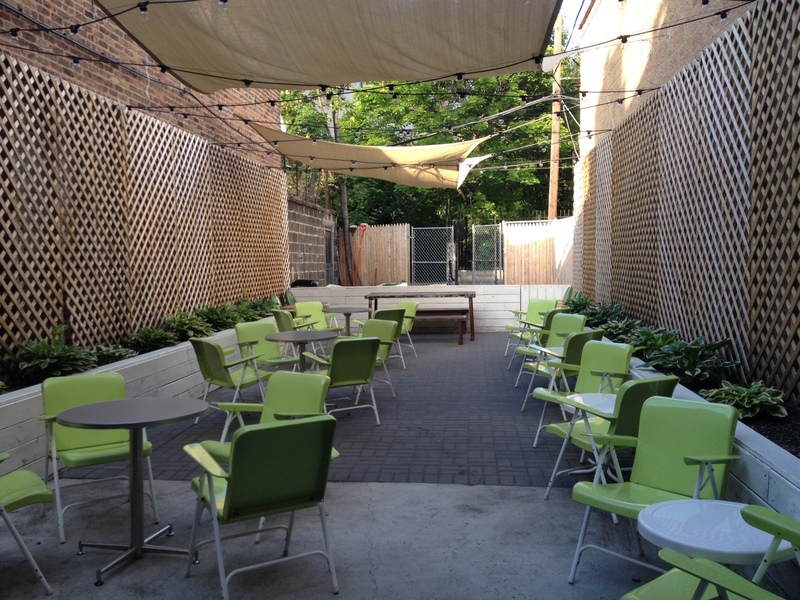 The backyard, with its small, elevated grassy expanse and iron cafe chairs, is perfect for wiling away summer afternoons. Ear Inn: Billed as NYC’s oldest bar, this Hudson Square institution has been slinging alcohol continuously since 1817, even during Prohibition. Most out-of-towners go to McSorley’s and miss out on this eccentric spot. Here’s why it’s a can’t-miss: the atmosphere is classic New York, the drinks and food are simple and well-made, and the crowd–a mixture of low-key locals, a post-work crowd, Soho deserters, and a smattering of tourists–is a microcosm of the city. 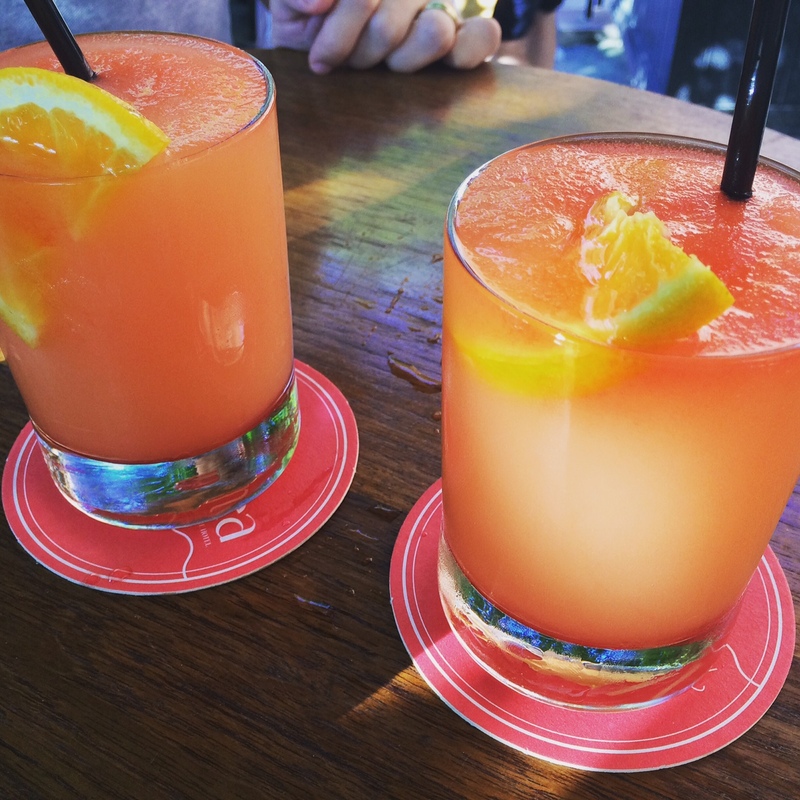 Red Hook Bait and Tackle: This eclectic Red Hook bar pairs well with a visit to the Morbid Anatomy Museum, mentioned above–the welcoming interior is covered in tchotchkes and an array of taxidermy. It’s not just about the decor, though. It’s also standout for its friendly, laid-back vibe. This bar is the kind of watering hole every neighborhood wishes it had. I think the explanation is four-fold. First, photo-sharing apps like Instagram have given us the newfound ability to tempt family and friends, in real-time, with photographic evidence of our food adventures. Who cares if the taste was mediocre? The pictures are beautiful! And on that note, which memory is more likely to last–the taste-bud related one or the visual one, which you can revisit any time? Second, there’s a shared-experience element to the misery of waiting hours for something. You and your fellow line waiters survived that misery together. “Can you believe we did that?” you’ll giddily say to one another once the whole thing is over. “I waited five hours in the cold rain,” you’ll recount to family and friends. The subtext here is: I’m determined and I’m patient and I don’t give up easily. And aren’t those prized virtues in a world where human attention spans have fallen to an average of eight seconds thanks to smartphones? Third, everyone seems to have FOMO, as the kids call it; the acronym stands for “fear of missing out.” The line itself is reason enough to stand in it, the thinking goes. Why would people wait if there was nothing worth waiting for? My mother used to tell me about an oft-repeated directive in the U.S.S.R.: If you see a line, join first, then ask about what’s at the other end. In a country with constant scarcity, this was smart. In modern-day NYC, it doesn’t make much sense. I try not to judge all the those waiting in interminable lines around the city. They’re enjoying themselves, I’m sure, and they’re creating lasting memories. I just hope those hours-long waits don’t keep them from experiencing some of the city’s true gems. -Long restaurant waits are fine if I can leave, and they’ll call or text me when my table’s ready. –Ample Hills Creamery ice cream. The line moves fairly fast and it’s usually warm out when I crave ice cream. –Katz’s Delicatessen. It’s an institution–a delicious, delectable institution. –Totonno’s. It’s worth a wait, but I’m still only up for it if the line is shorter than four or so parties. –Absolute Bagels. The line is rarely longer than about 15 minutes, and the bagels, my god. –Clinton Street Baking Company. Only during Pancake Month and only for dinnertime pancakes. It’s a years-long tradition with a friend, and I make no excuses. What foods would you wait for? *New Yorkers generally use “on line,” but even after nearly a dozen years in the city, I still can’t bring myself to say it. The New York Times wades into the debate. It’s known the world over that New Yorkers love to complain. We love our city, but man, the weather, and the traffic, and those annoying tourists, and is that new upstairs neighbor a saw musician? Get a New Yorker talking about the city’s most famed food and the complaining will quickly be replaced with unabashed bragging. We’re the best at pizza. THE BEST. (NYC! NYC!) Here, it’s pretty much an essential food group. Along with fruits, vegetables, whole grains, lean meats, fish, and dairy, a thin, crispy slice of cheese (and sometimes sausage or pepperoni) is part of a well-balanced diet. When you live here, you learn to crave it. I rarely go a week or two without eating at least a slice. Below are the places I crave and frequent most. 2. 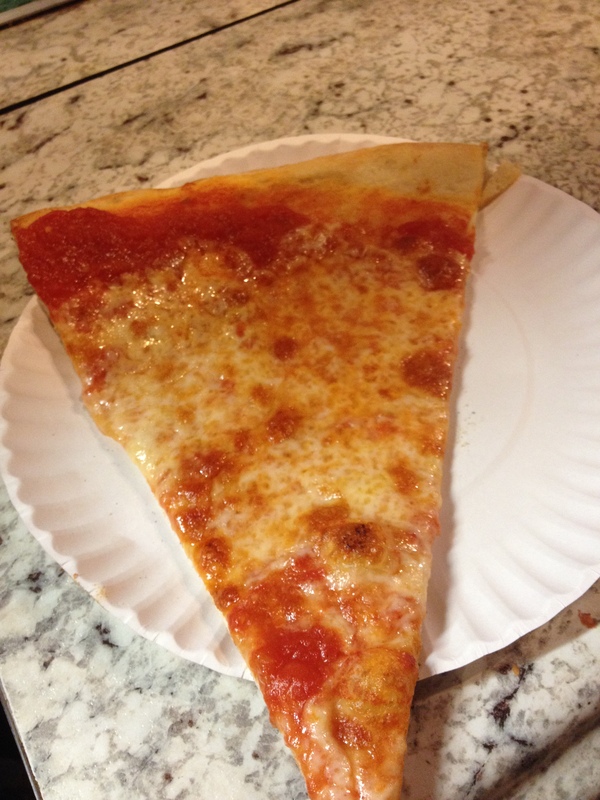 Williamsburg Pizza: This standout joint with locations in Williamsburg and the Lower East Side features quality ingredients and a showcase crust. 3. Joe’s Pizza: Everyone knows Joe’s. 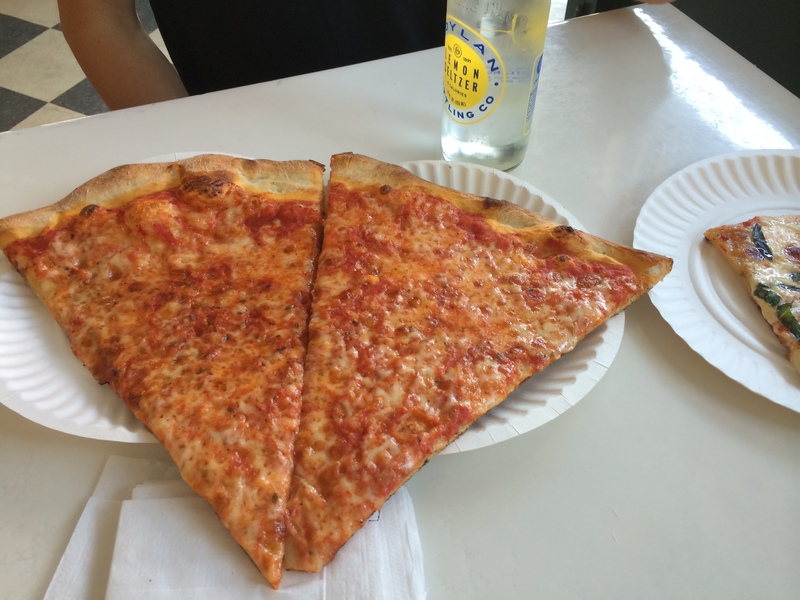 It’s been the place to go for a standard NYC slice since 1975. It’s STILL the place to go in 2015. 4. Don Antonio by Starita: The signature lightly deep-fried “Pizze Frette” pie at this Midtown restaurant is outstanding, but the “Pistacchio e Salccisia,” a white pie with pistachio pesto and sausage, is the dish I lust after. 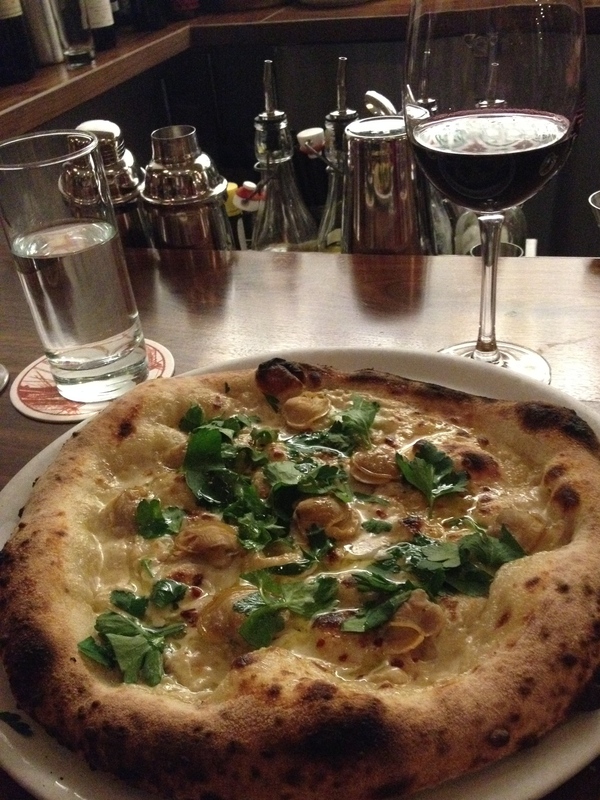 Pizze Frette at Don Antonio by Starita. Courtesy of Garrett Ziegler, Flickr.com. Made available via Creative Commons license. 5. 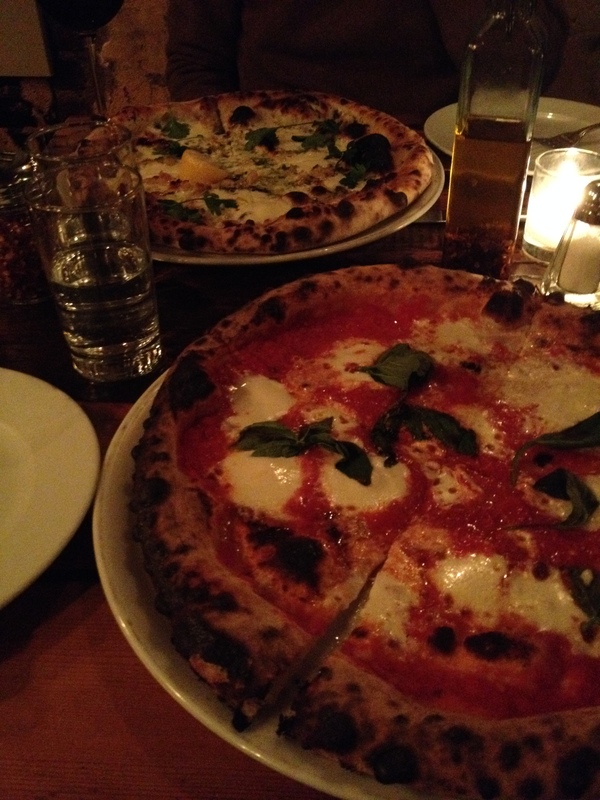 Giuseppina’s: A sort-of offshoot of the impossible-to-get-into Lucali (it’s run by the Lucali owner’s brother), this spot has the freshest ingredients and a quintessential NYC crust that’s not too crackery. 6. Franny’s: Manhattan crowds park their fancy cars outside this popular Park Slope spot to sample some of the best Neapolitan pies this side of Naples. I’ve been to nearly every buzzy Neapolitan establishment in the city, and I still think Franny’s, which opened 11 years ago, serves the airiest, most flavorful pizza with the best crust. Do you see the clam juice, garlic, parsley, chiles and olive oil marinating on that pie? So freakin’ delicious. 7. Barboncino: Featuring large and tasty Neapolitan pies in a festive atmosphere, this Crown Heights restaurant is an ideal destination for a low-key date night. 8. 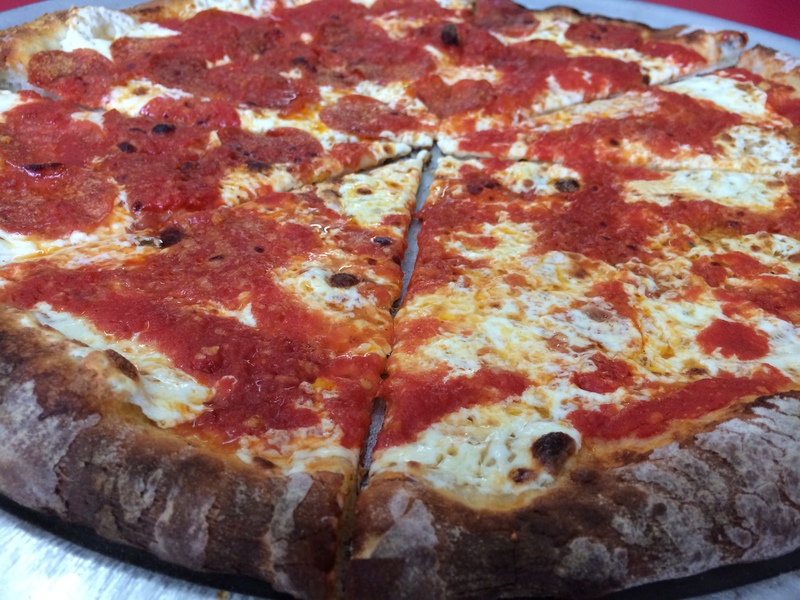 Totonno’s: This throwback coal oven-baked pie, made from the same recipe for nearly a century, is a near-perfect iteration of a classic NYC pizza. Though I’m fairly confident in my NYC expert status, I do have a blind spot: bars. I’m not a big bar hopper. I’m not always aware of the coolest dive bar with the just-surly-enough bartenders or the latest microbrewery bar with the 3 dozen beer taps. I do love well-made cocktails, though. And, I love drinking them outdoors in snazzy backyards come summertime. 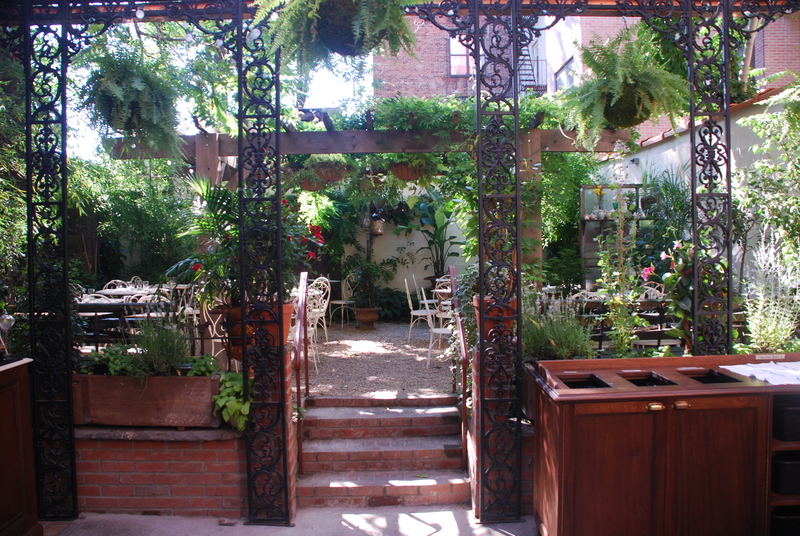 It’s a quintessential New York warm weather experience. Below, a list of places to check out. Weather Up: A moody upscale bar in Prospect Heights with delicious, well-priced cocktails. The drinks take a while (a good sign, I think? 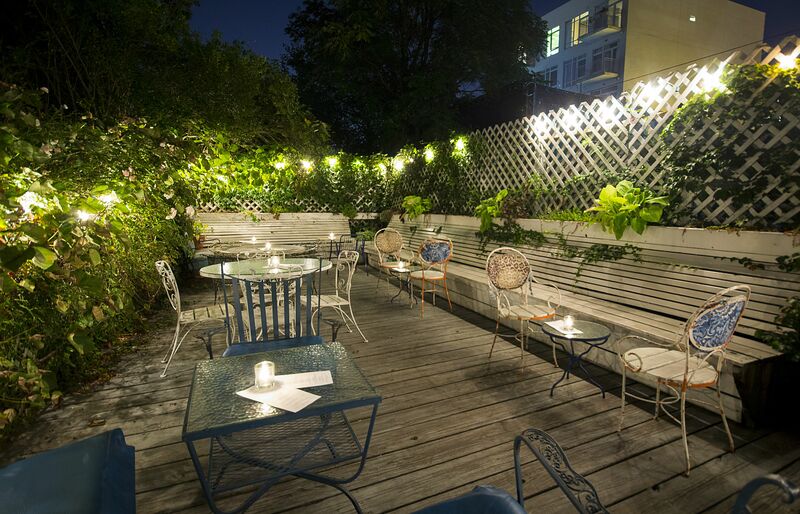 ), but you can wait in the string bulb-lit, verdant backyard, which has ample seating. Thanks to the vegetation and the Brooklyn humidity, it can get muggy back here. Take advantage of the bug spray at the yard’s entrance! 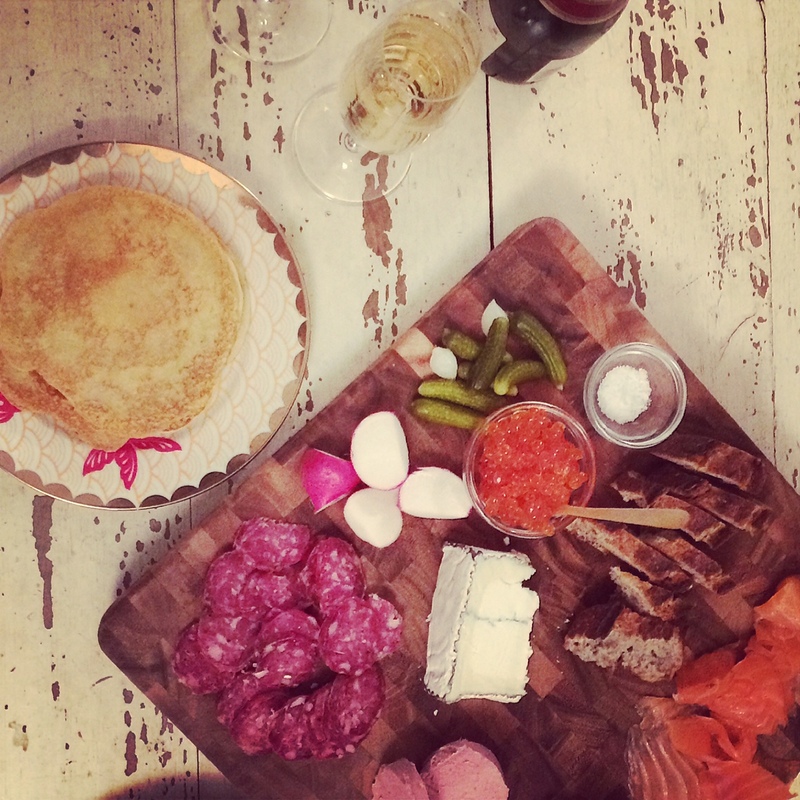 June: This Cobble Hill newcomer is winning fans all over the city. The thoughtful interior is downright beautiful, the small plates are delicious, and the natural wines are unique. The cocktails, which feature uncommon ingredients (just ask and the waitress will explain), are strong and tasty. Did I mention the prices are reasonable? The backyard, which wasn’t completed when things first started to warm up, is now ready for the spotlight. 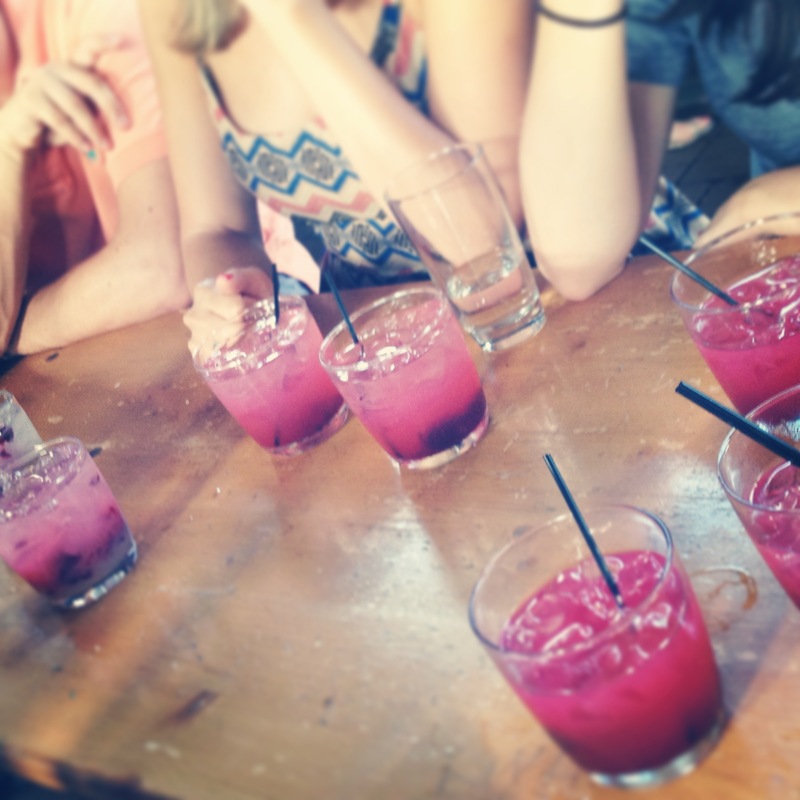 Leyenda: Cobble Hill seems like the place to drink this summer. This new bar on Smith Street from cocktail maven Julie Rainer and aptly named partner and rising star Ivy Mix, has all the makings of a summer hotspot: an extensive list of creative Latin American-inspired cocktails and punches, tasty small plates from acclaimed chef Sue Torres, and a bare-bones, but pretty backyard perfect for a friend date. Tooker Alley: They take their drinks very seriously at this Prospect Heights watering hole (binder menu, orchid garnishes), but the bar, especially on weekdays is void of pretension. The retro outdoor space with green plastic chair and twinkling lights amps up the casual factor. Huckleberry Bar: The lush yard at this East Williamsburg cocktail bar is a haven in a not-very-tree-filled part of Brooklyn. They’ve been open for 8 years, so they’ve had some time to hone their craft. Unlike similar establishments that close their yards before midnight, this yard stays open until 1 a.m. The Raines Law Room: This Flatiron destination is best avoided on weekends, when waits can be cruel. Weekday evenings, though, it’s great for an expertly made, albeit very pricey, cocktail with a friend or date. The back garden is teeny, but lovely. Lavender Lake: Ah, the Gowanus–the polluted waterway that’s attracting loads of development along its banks (only in New York?). What the area does provide is space, and there’s loads of it at this chill, expansive bar. Come early to snag a table with an umbrella and wile away the afternoon with a refreshing cocktail and some fried brussels sprouts. 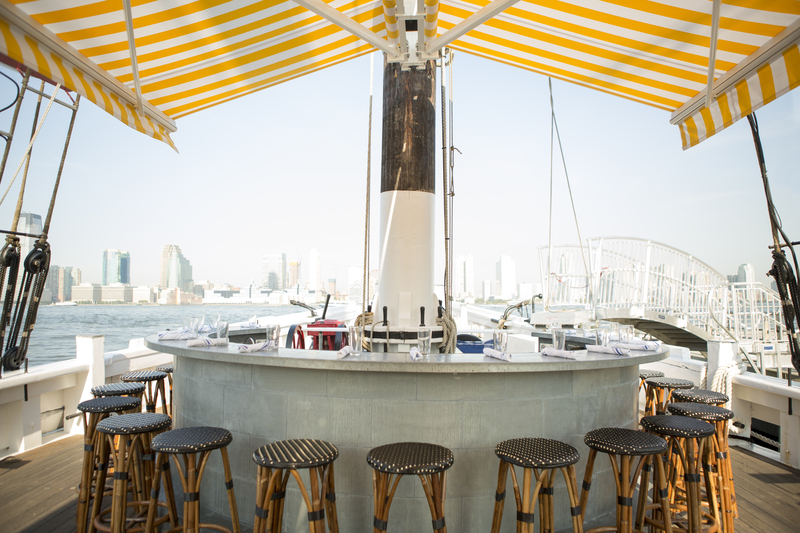 Mulberry Project: If Maison Premiere transports you to seaside France, the backyard (named La Isla Escondida) at this Little Italy lounge makes you feel as though you’ve hopped a super quick flight to coastal Mexico. 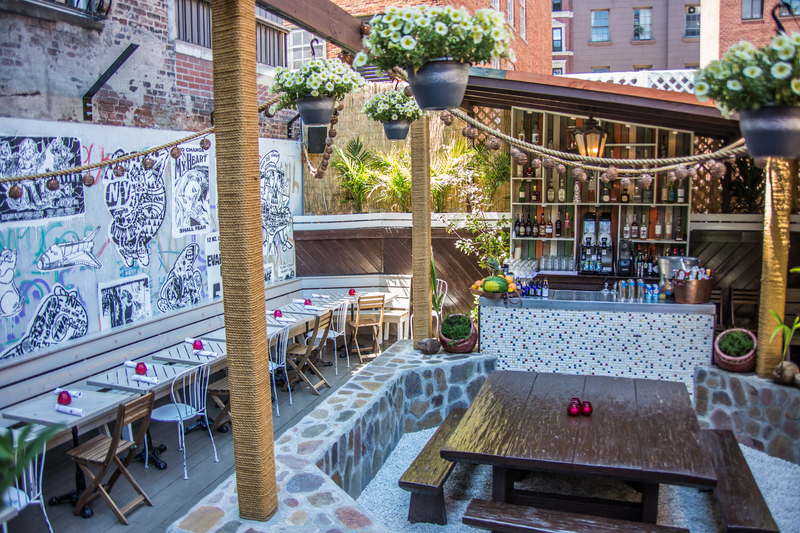 Graphic murals, bright green artificial turf, multicolored tile and straw thatch couple with fuchsia and lime-hued cocktails to create a vibe that’s anywhere but NYC. 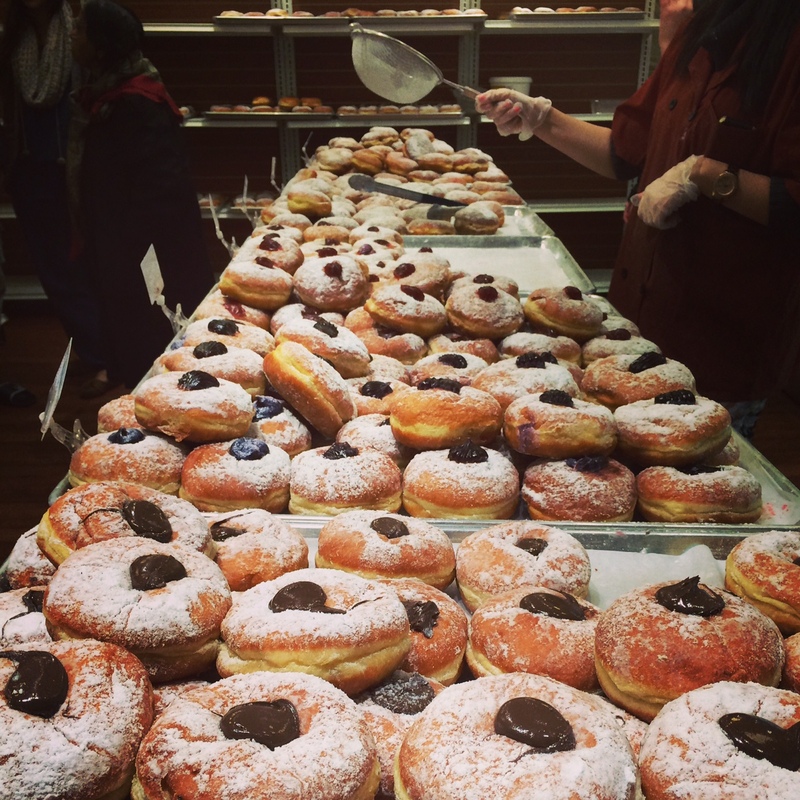 Is This the Best Jewish Bakery in Brooklyn? There was a time when Jewish bakeries in the outer boroughs were as ubiquitous as patisseries in Paris. Turn a corner, grab a babka. Walk up the street, pick up an onion board. Much like other vestiges of Old New York, they’re growing rarer by the day. Check any food forum (like chowhound.com) and you’ll see a lot of posters lamenting the Jewish bakeries of yesteryear. Many owners have retired, and, along with the clientele, moved away. All hope is not lost! On a random trek through hasidic Crown Heights, my husband and I encountered Gombo’s Heimishe Bakery. The only bakery on Kingston Avenue, the only major commerce strip in the neighborhood, the shop does brisk business. In Yiddish parlance heimishe or haimish means down-home and unpretentious. 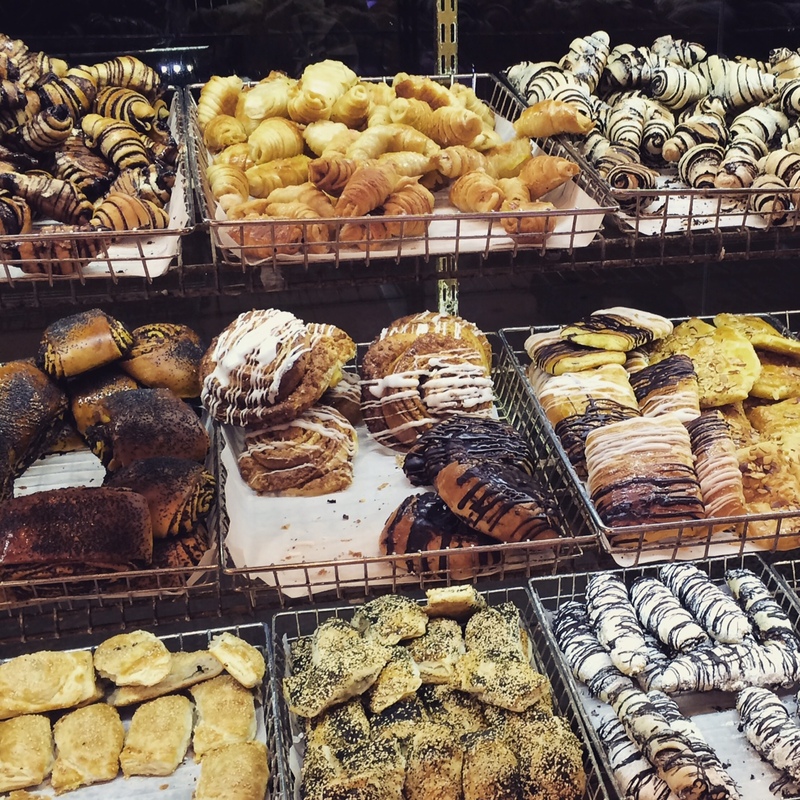 As a type of bakery, the term seems to convey an Eastern European-style pastry shop that features a variety of rustic sweets.There are a lot of Jewish desserts, like rugelach, as well as non-Jewish specific regional treats like danishes. The chocolate danish-like pastry we sampled at Cheskie was warm, chewy–incredible–and the babka we brought back for family prompted an attempted from-scratch reconstruction. At Gombo’s, there are nearly a dozen items that could be described as “chocolate and dough in rolled-up form.” Soft chocolate rugelach (a type popular in Israel), drier American-style chocolate rugelach covered in powdered sugar, chocolate danishes, large chocolate croissants, chocolate cigars…I think you get the idea. My favorite items were a poppy seed bun and slice of the chocolate strudel-like pastry by the counter, which is cut to order. The local kids, though, were all making a beeline for the bright glaze-covered yeast doughnuts. Mornings or early afternoons are the best times to snag fresh pastry, and there’s a line on Fridays for their fresh challah. I’m of two minds about spending the holidays in New York. On the plus side, the city is decked out in her prettiest outfit, all sparkles and glitter and polish. On the other hand, it is swarming with tourists to the point where, if you’re not careful, you can literally get stuck among the scrum, just as my husband and I were last Christmas Eve Day near the Rockefeller Center tree. We had to make a harrowing escape via a small opening near Saks. But there is a lot to love. The celebratory restaurants at your disposal, for one. We celebrate Hanukkah, and each year we make a pilgrimage to eat some latkes at a traditional Jewish deli. This year, though, we tried something different. On the 6th night of Hanukkah we rented a Zipcar and drove to Stix Kosher Restaurant in Forest Hills, Queens. This homestyle establishment specializes in the cuisine of Bukharian Jews–a Central Asian population with a distinctive culture whose history in the region dates back millenia. Lamb is what they do best, and the varieties we sampled were tender and not-at-all gamey. 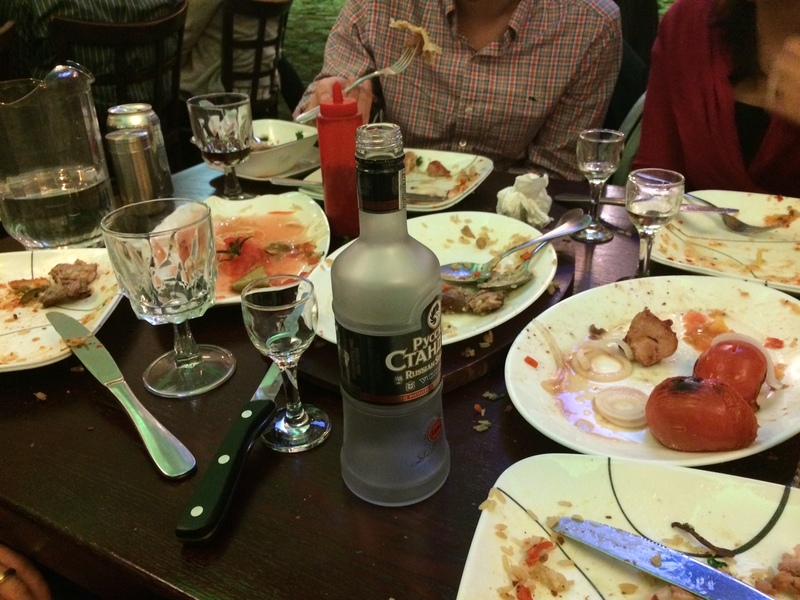 We feasted on lamb plov, kebabs, chebureki and traditional tandoori bread. All around us, large tables of families were toasting to birthdays and the holiday with BYO bottles of vodka and brandy. It was an incredibly festive and warm atmosphere. After dinner, we were craving sufganiyot. These filled doughnuts are traditionally enjoyed during Hanukkah to commemorate the oil burning miracle at the center of the holiday. They’re similar to American-style jelly doughnuts, Italian bomboloni and German Berliners. We stumbled upon Queens Pita, which wasn’t just serving one variety of sufganiyot; they had prepared a veritable smorgasbord of the pastry. We were in deep-fried, powdered sugar-coated paradise. I mean, just look at that photo. The ones in the foreground are filled with Nutella. NUTELLA! Just as God had intended. As Supreme Court Justice Elena Kagan admitted during her confirmation hearing, most NYC Jews spend Christmas at a Chinese restaurant. It’s a funny tradition with origins in the mere fact that, for a long time, those restaurants were the only ones open on a day when the usually bustling city is uncharacteristically quiet. 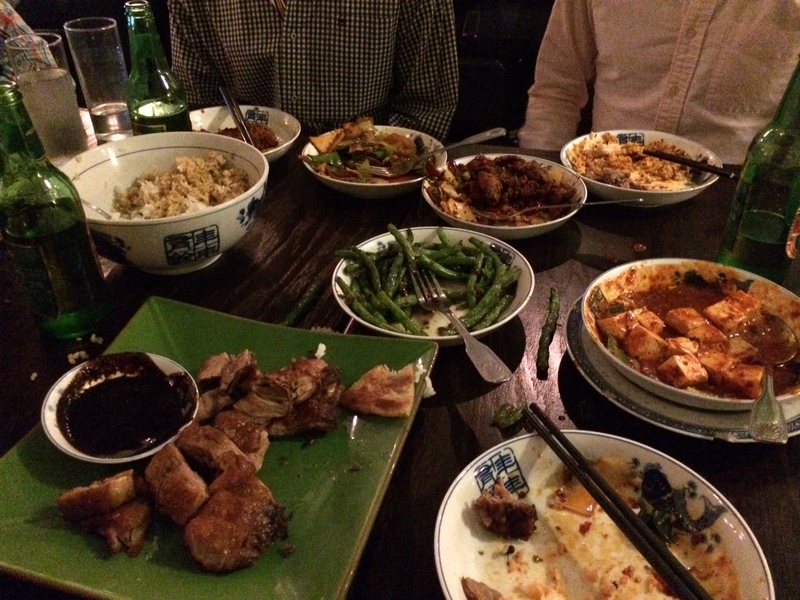 Local Chinese joints were the default place to grab a bite for cooking-averse New Yorkers. Many have also pontificated about the shared otherness both Jews and Chinese Buddhists experienced back when assimilation had a much stronger pull in predominately Christian American society. In order to get a meal in with family members who were leaving the next day, we decided to partake in a spicy Szechuan outing on Christmas Eve night as opposed to the much busier Christmas Day dinner hour. Café China in Midtown was packed with families of all stripes (including The Americans‘ Richard Thomas, out with his wife and two kids!) Festooned with kitschy throwback decor, the restaurant is a nice option for a slightly-more-upscale Szechuan meal in the area. The foods of the Szechuan region are covered in spices and mouth numbing peppercorns (ma la, in Chinese parlance). If you can handle it, order their specialties and not the American-Chinese entrees on offer. We enjoyed Szechuan noodles, dumplings in chili oil, scallion pancakes, tea-smoked duck, ma po tofu, spicy lamb, fried strings beans and twice-cooked pork. Over-ordering and enjoying leftovers later that night in your PJs is half the fun. Christmas Day is a relaxing day for us. No presents to open. No fancy dinner to make. We spend it lazing about the apartment and baking something from scratch. 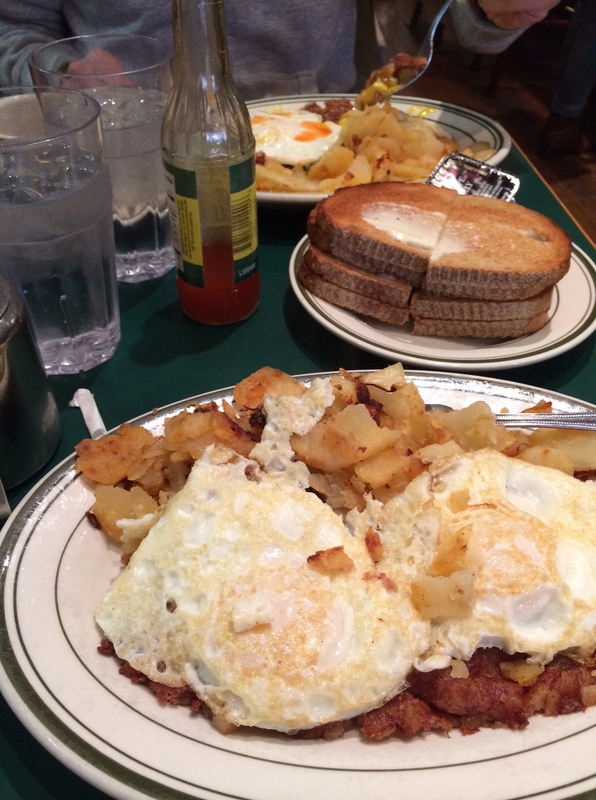 We had a breakfast of corned beef hash with two eggs over-easy (my favorite!) at a standby diner down the street. It was quiet, low-key, perfect. 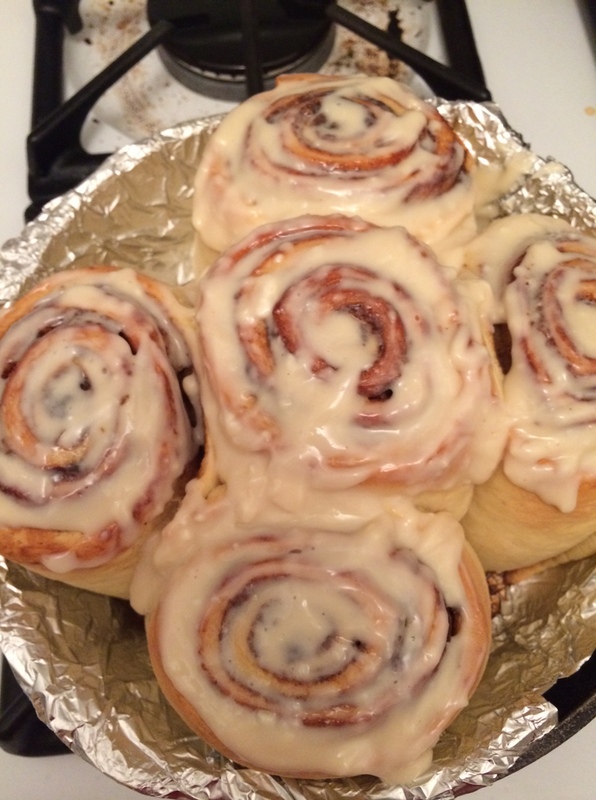 After a stroll in the park, I spent nearly all of the rest of the day making these cinnamon rolls. They weren’t too difficult, and as I’ve been doing with nearly every dessert this season, I spiked them with some bourbon–just a tablespoon or so added to the cream cheese frosting in order to give it a little extra sumthin’. We enjoyed the rolls with sparkling wine cocktails. A very merry Christmas, indeed. NYE in the United States is mainly a going out holiday. It’s about drinking, dancing, counting down until midnight. In Russia it’s much more–it’s a Thanksgiving-level celebration. There, New Year’s Eve is a HUGE deal. After the Communist Revolution and the subsequent suppression of religion, the traditions surrounding the day mirrored those of Christmas–a decorated tree, a Santa Claus-like figure, presents–though completely void of any religious meaning. (Actual Russian Orthodox Christmas is celebrated on January 7th). Since moving to the U.S., my family has dropped most of the Christmas-like traditions (except for the presents part, natch), but NYE doesn’t feel right without a festive meal that includes caviar, sweets and champagne. My husband and I were going out with friends on the actual day, so we made the meal–complete with homemade crepes–on December 30th. It was freakin’ lovely. 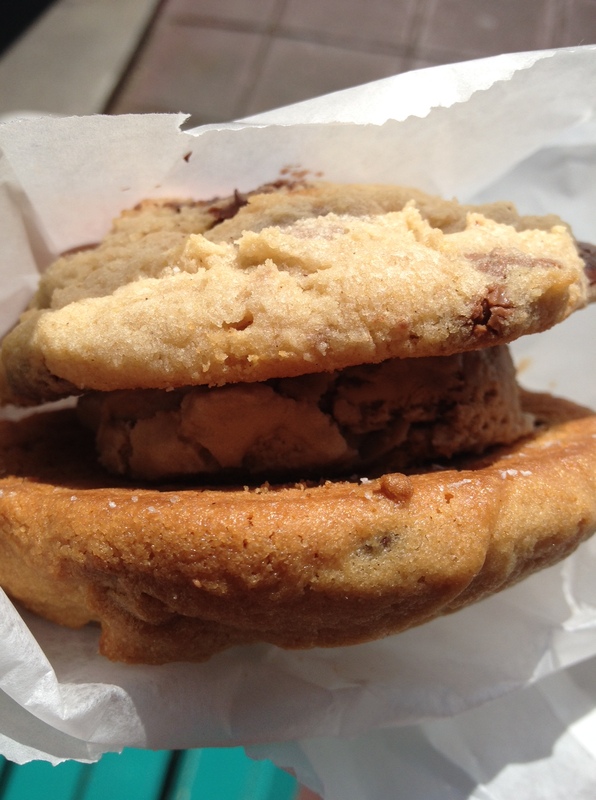 Last summer I posted a comprehensive roundup of the best made-to-order ice cream sandwich in NYC, and there were plenty of formidable contenders. This season brings a few new examples that up the ice cream sandwich ante. 1. 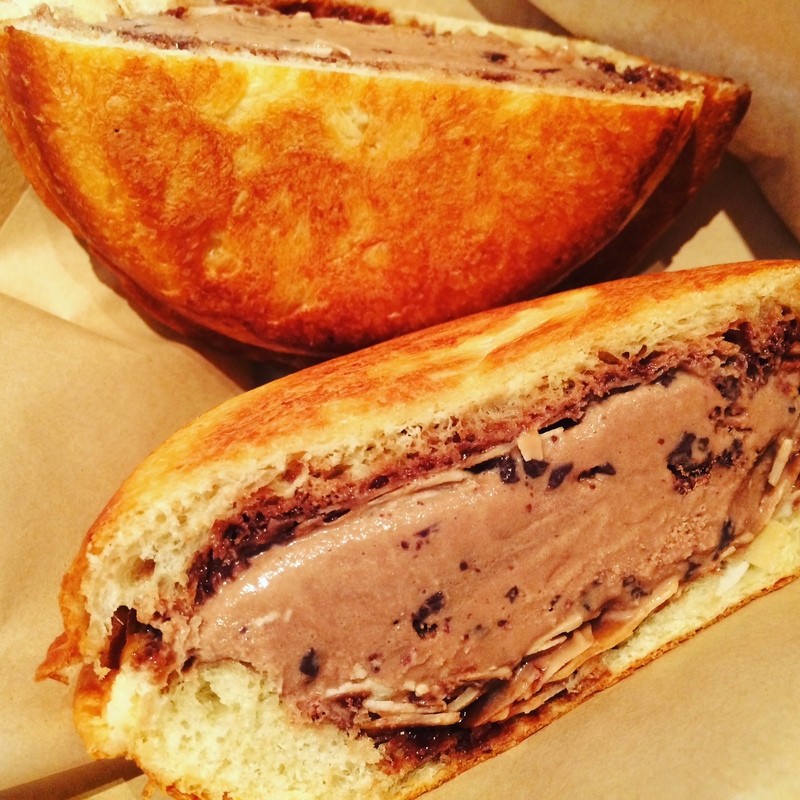 I mentioned a version of the brioche-gelato sandwich before, but the Italian-by-way of Brazil gelato shop A.B. Biagi does it one better by offering their take. The Pain Gelato features a choice of three brioche flavors–chocolate-chocolate nibs, orange blossom and regular–sourced from stellar Brooklyn bakery Bien Cuit. Each pairs well with a different gelato flavor. 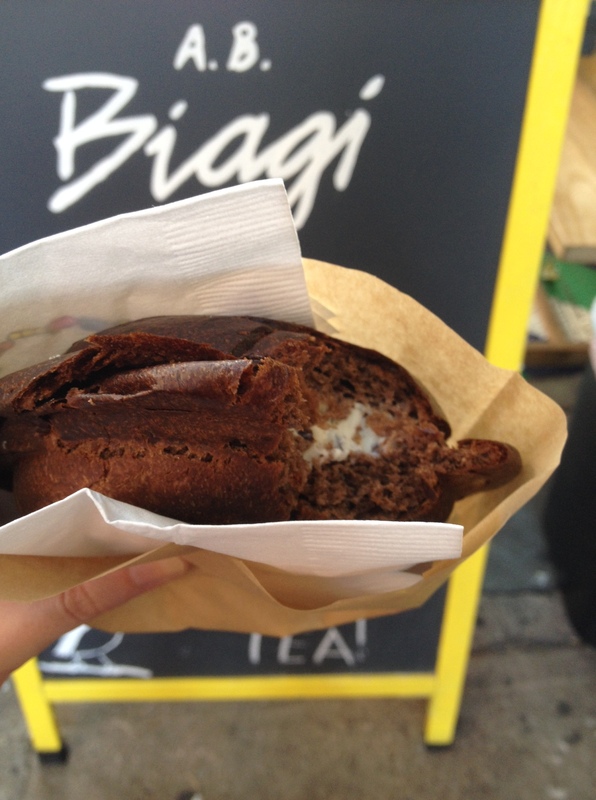 My stracciatella (similar to chocolate chip) went well with the chocolate brioche, which I wasn’t at all angry about. They place the brioche and gelato in a special, waffle-press-like contraption until the sides of the brioche are sealed. The result is a warm, crisp pocket filled with cold, silky gelato. There’s something especially indulgent about eating dessert in the form of a sandwich. There are two caveats–one, at $8, it is pricey and two, because they don’t want the gelato to leak out of the sides, the scoop is pretty small. 2. Dominique Ansel Bakery is best known for the perpetually imitated Cronut, but the shop’s signature item is a smaller version of the classic Breton pastry kougin-amann. The pastry is flaky, layer-y and sugary, similar to a croissant, but with a more pronounced caramelized, rather than butter, flavor. For their version of an ice cream sandwich (which technically isn’t new, but it’s new to me! 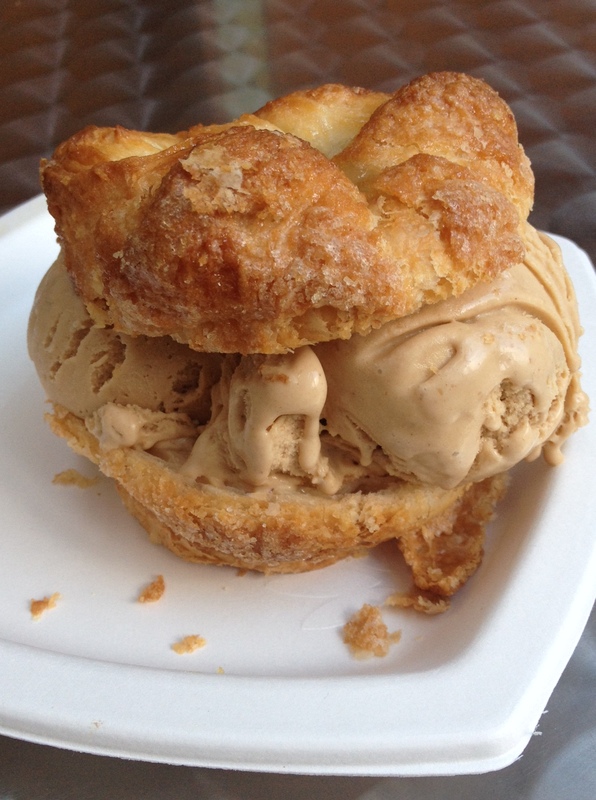 ), they take a DKA (Dominique’s Kouign Amann), cut it in half and fill it with two scoops of ice cream. The prailene ice cream creation below, for $6.75, was, for lack of a better word, awesome. The pastry is solid enough to hold the ice cream in place, and it’s sweet, but not overwhelmingly so, providing a perfect complement to the richness of the ice cream. 3. So this creation from recently featured ice creamery Hay Rosie Craft Ice Cream Co. is utterly insane–in the best possible way. Referred to as “the barnburner,” and costing a reasonable-for-its-size $8, this take on the ice cream sandwich incorporates ice cream nestled between a rotating roster of bookends. The day I went there was a choice between slabs of raw chocolate chip cookie dough or actual PB&J sandwiches. After assembly, both the filling and the shell are placed into the very same machine used to create the Pain Gelato, above. The chocolate chip cookie dough barnburner, which I paired with Grape Nuts ice cream, was rich. Like, this-is-really-good-but-I-can-only-eat-a-tenth-of-it rich. The dough had been warmed just enough to create some crispiness, but its DNA was still very much dough. I indulge in a bit of raw dough eating every now and then, but it’s not my absolute fave, the way it is for some. If that means you, you have found your kryptonite. 4. Newish Park Slope bakery Buterrmilk Bakeshop specializes in homestyle desserts, and their take on the ice cream sandwich reminds me of the sort of satisfying concoction you’d create in your own kitchen. Pick any two of their cookies–I went with one peanut butter and one chocolate chunk–and add a scoop of their homemade ice cream–I opted for coffee almond. The cookies are soft, buttery and crumbly, which makes the sandwich easy (no rock-hard cookie to fight your way through), albeit very messy to eat. 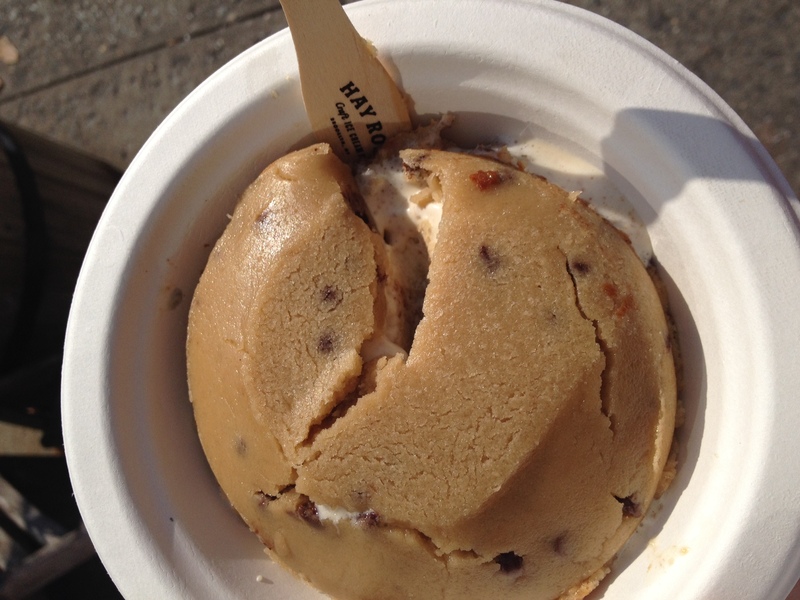 At $5.50, it’s also a pretty good deal in the NYC ice cream sandwich market.